I stated at my Parliamentary approval hearing to be appointed the Special Prosecutor and again during an interview I granted to CitiFM’s Umaru Sanda and Daily Graphic’s Mabel Aku Baneseh on Monday, 14th January 2019 that I endeavor to keep suspected accusations of the commission of crime against fellow citizens on the quiet until investigations disclose a chargeable offence that can be presented before a court of competent jurisdiction. But I also caveated that when a suspect discloses being investigated for crime and misrepresents the facts, my hands are forced to correct such misrepresentations. I did not know that while I was granting the interview on Monday morning 14th January 2019 to CitiFM and Daily Graphic, the Office of the Special Prosecutor and my person had been attacked the previous day in a “Breaking News” article purporting diversionary propaganda and a sinister political ploy around the prosecution of an Honourable Member of Parliament. Let me be clear. Nobody will use me or my Office for political investigations or prosecutions while I remain the Special Prosecutor. My track record attest to this fact. I bowed out as the Attorney General and Minister of Justice in January 2012 because I refused to be used for the prosecution of fellow citizens purely on party political grounds. There was a time I insisted on prosecuting President Mill’s cousin on three dockets for corruption, breach of procurement procedure in the purchase of motor bicycles for the Ghana National Fire Service, and breach of procurement procedures and laws in the procurement of regimental band equipment for the Ghana National Fire Service. One of the suspects in the corruption case was my own late housemate in Martin Luther King House in Navrongo School, Hallmate in Commonwealth Hall, Legon, and my very close friend as a lawyer who was then a Chief State Attorney at the Attorney General’s Office. It is an open secret that the late President avoided a prosecution only by asking my deputy to collect the three dockets from the Director of Public Prosecutions and lock them up when I was attending the Commonwealth Minister’s Conference in Sydney, Australia in July 2011. Let me repeat: Nobody can use me or my Office for political investigations or prosecutions as long as I remain the Special Prosecutor. Thankfully, this President has kept his promise of giving me a free hand in fulfilling my mandate under the Office of the Special Prosecutor Act, 2017 (Act 959). Several misrepresentations must be corrected. Hon. Mahama Ayariga was never invited to the Office of the Special Prosecutor on 14th January 2019 over any investigations or for questions concerning the procurement of “an ambulance for the Constituency which was supported by Bawku Municipal Assembly…” Hon. Mahama Ayariga was accompanied to the Office of the Special Prosecutor by an investigator from the Economic and Organised Crime Office to be questioned over an urgent letter that was written by this Office to the Commissioner-General of the Ghana Revenue Authority, Mr. Kofi Nti, which was not copied to any other person or entity. The letter found its way on WhatsApp from the GRA to the Hon. Mahama Ayariga who in turn forwarded the message on WhatsApp with impunity to the Executive Director of the EOCO on 24th December 2018. I was informed about the WhatsApp on 25th December 2018 and was emailed a copy on 27th December 2018 after persistently asking for it. The EOCO and this Office have been investigating the Hon. Mahama Ayariga for obstruction of investigations and other suspected offences and therefore his act of engaging with WhatsApp messages to EOCO was daring and suspicious. Hon. Mahama Ayariga appeared before EOCO on 4th January 2019 but was not questioned on the source of the leakage from GRA, nor was his phone taken as exhibit. He was rather allowed to travel to his constituency without my knowledge as the person directing the investigations. Consequently, I sought the concurrence of the Minister responsible for the GRA to investigate the leak of my letter to Mr. Kofi Nti and to Hon. Mahama Ayariga and then to EOCO. Hon. Mahama Ayariga was accompanied by two lawyers to the investigation’s division of this Office on 14th January 2019, where he made a statement admitting the WhatsApp he sent to the Executive Director of EOCO and he was granted bail. This investigation is very important for the fight against corruption because a lot of funds have already been lost to the public purse from leakages of actions to be taken by GRA to recover monies from tax evaders. This particular case gave me the opportunity to try and get to the bottom of that canker of corruption. The investigation on the leakage of my letter from the GRA is on-going in spite of those who claim to have powerful relatives in the Government. Hon. Mahama Ayariga and his lawyers can confirm that he was not questioned about any alleged ambulance for Bawku Municipal Assembly on 14th January 2019 nor was the matter of an ambulance alluded to in his investigation or statement. Four photographs of Hon. Mahama Ayariga smiling in the company of one of his lawyers are exhibited in the news as they exit this Office on 14th January 2019 showing that there was no propaganda to prosecute anybody at the behest of any Government in power. Coincidentally one Yakubu Mumuni Nambe, an Assemblyman for the Bawku Municipal Assembly and a relation of Hon. Ayariga on the mother’s side had been invited the same day for questioning in relation to the purchase of an ambulance by the Bawku Municipal Assembly. The Municipal Chief Executive, Hon. Hajia Hawa Ninchema, appointed by President and others, had already been interrogated quietly as is our style on previous occasions on the same ambulance – but never Hon. Mahama Ayariga. Hon. Yakubu Mumuni Nambe made a statement to the detectives in my Office and was admitted to bail. It had nothing to do with Hon. Mahama Ayariga’s appearance at this Office on 14th January 2019. Whether or not Hon. Mahama Ayariga would be invited on any ambulance case will depend on a determination by the detectives investigating the case of the Bawku ambulance. Hon. Yakubu Mumuni Nambe and Hajia Hawa Ninchema are not NDC members. Hon. Nambe’s elder brother is an appointee of the President on the National Petroleum Authority Board. The Municipal Chief Executive is a known NPP member and I am not going to stop an investigation because of that. Hon. Mahama Ayariga is my son and will remain my son under the custom of the Bawku township where he and my first daughter, Hagar, were born in 1974 and where his parents and I grew up. But crime will be treated as crime should he or Hagar commit any offences under my watch under Act 959; period! I am also investigating another breach of the Public Procurement Act which affects this Office directly in which the suspects have failed or refused to report because they think they have connections in the Government. However, I can assure the public that while I occupy the role of Special Prosecutor, crime will always be treated as crime and no political party card can act as an insurance against investigating and/or prosecuting any offences that fall under my mandate under the Office of the Special Prosecutor Act, 2017 (Act 959). I am determined to maintain the confidence Ghanaians placed in me in supporting my approval and appointment by the President as the Special Prosecutor until otherwise decided by a court of competent jurisdiction. 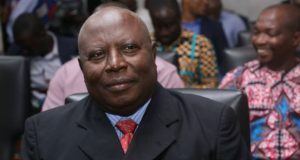 The post Martin Amidu writes: Stop politicizing purely criminal conduct appeared first on Citi Newsroom.